1. There was a play in Ohio State’s win over Iowa last week where Andrew Dakich was heading to the rim on a fastbreak. He jumped, looked like he was going to put up a layup, then spun away last minute and instead left a pass for a trailing Jae’Sean Tate. Tate finished it. It might not have looked pretty, but it was a plus play for the Buckeyes. Ohio State coach Chris Holtmann would probably tell you in hindsight that it was even the right play. And it wasn’t the first time Dakich tried something like that this year. He’d prefer to give the ball up in that situation. That does, tough, highlight something that could be become a problem for Ohio State. 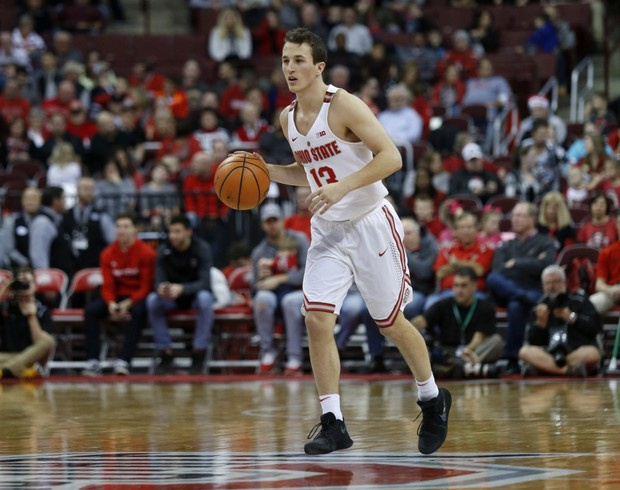 At some point, Dakich is going to have get comfortable providing some scoring — so that the Buckeyes don’t have to rely on the starters for all of the scoring output. “That’s just kind of who (Dakich) is,” Holtmann said Wednesday ahead of a Thursday night game against Maryland at Value City Arena (7 p.m., ESPN2). Dakich is certainly a pass-first kind of player. Through 17 games, he’s attempted 27 field goals, fewer than two per game. He’s had four games in which he’s played double-digit minutes, and had zero field goal attempts. He’s also third on the team in assists with 2.4 per game. Dakich does have excellent shooting numbers this year, even if the sample size is small. Playing triple the amount of minutes he ever played as a walk-on at Michigan, Dakich is shooting 66.7 percent on field goals (18-of-27) and 70 percent on 3-point field goals (7-of-10). One of those 3s came when he banked one in from long range at the halftime buzzer of a win over then-No. 1 Michigan State last Sunday. Those were Ohio State’s only bench points in a 80-64 win. Ohio State guard Andrew Dakich (AP). If it sounds crazy to say that a player like Dakich, a late addition to the roster simply to provide guard depth, should also be providing an offensive punch. Well, it is kind of crazy. That’s also the nature of the roster. And it just feels like getting little to no scoring off the bench won’t be sustainable if Ohio State (13-4, 4-0) is going to turn this into a season where it actually contends for the Big Ten.